Water Treatment Company, HM&V Utilities Ltd has over 30 years experience in the management of water systems, analysing technical and administrative problems and carrying out consultancy work on behalf of companies. HMV Utilities Ltd is one of the top water treatment companies and operates in all areas of Hampshire, Surrey and Sussex, M25 and Home Counties. Installation of Gas + (LPG) & Water mains and services (PE or metallic). Testing—purging—commissioning of new and existing gas mains, internal and external. Decommissioning of gas mains, underground and internal pipe work prior to demolition or alteration. Chlorination and hydrostatic testing of new and existing water installations. Electro-fusion jointing of all PE pipe. Live gas and water connections. Geothermal heat source, underground pipe work installation (slinky installation). Moling (thrust boring) Trench less pipe installation. It is company policy to encourage all our customers to come up to correct standards. Health and Safety data is available upon request. HMV Utilities Ltd are members of both the British Association for Chemical Speciailitites (BACS) and the Water Management Society (WMS). 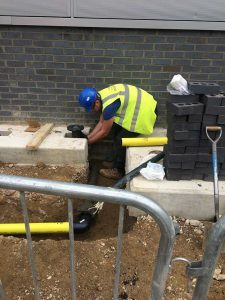 If you’re interested in any of our services whether it be water treatment, gas mains works, sewage / waste water treatment, please do not hesitate to get in touch with us and see how we can help. We has a plethora of experience in our industry and can tailor services to fit the needs of your project. alternatively, send an email to: info@hmandv.co.uk or click here to visit our contact page and send an online enquiry using our website contact form.